What Ukrainian volunteers and their patrons can learn from their Jewish counterparts. Ukrainian society is currently going through a natural surge of charity: people are supporting each other, soldiers, wounded people, etc. So far this support has been spontaneous. This spontaneous intention to help those near and far away has a real chance of growing into a habit. And even into a national tradition. No community has collected as much money to help those in need as the Jewish community. These old traditions of collecting money are connected with the word itself. We do not understand the word “charity;” we have the word “Tzedakah.” “Tzedakah” comes from the word for “justice,” and in our community, helping the needy is one of the foundations of society. Helping one’s neighbour is a commandment from the Torah. The Bible says: “Do not let your brother be poor.” People should be helped, and you should not let them become beggars, but help them into work. And this is to help the needy, those who do not have the chance to work at this time. If life has given one person the chance to earn his living, then he must understand that he has an obligation before the world to act justly and share his living. It is our tradition to collect money every day. The members of the community have money boxes at home. Some have them for each member of the family. And we do try to give money every day. Who are we helping? There is no policy of giving commands; we ourselves decide who we are going to help. Whole books have been written about how to give and who to give to. I shall try to explain with an example. There was a terrible tragedy in Nepal recently. People asked who they should support? Help the Nepal victims or refugees from Donbas? The Jewish tradition would be to help the neighbour, the refugees from Donbas. According to the rules, one must first of all help one’s parents. The inhabitants of one’s city. One’s country. There are twenty points listed in order of priority, who to help, who to give money to. A foreign country comes in 19th place! The land of Israel and Jerusalem are in 19th place, central places in the life of every Jew! Relatives are in first place. The recommendations of respected rabbis are also considered with regard to charity. For example, in New York there is a diamond district whose inhabitants came from Holland. All big donations are collected through the letters of recommendation of rabbis who are trusted. So support and charity are a centuries-old habit, and no one has feelings of pride because he is helping. Because everyone is doing it. People do not like to boast about it and they do not like their name to be remembered. If the giver’s name has to be given, then they usually write the name of their mother and of her father. This way it is not possible to distinguish who has given. I notice that in Ukraine here we do not have a habit of giving every day. That there should be a money box in the home and that everyone puts in at least 25 kopeks when they go to work. Why has a tradition of charity not developed here? The Soviet Union de-humanised people. The understanding was created in society in which there were no poor or rich people in the land. After the revolution in Tsarist Russia, a famous rabbi said that this regime would not last very long. Why? Because according to Judaism, helping the needy is one of the basic tenets of the universe. It is written in the Bible that there will always be poverty until the end of time. Anyone can fall into poverty and when he does, his neighbor should help him. Once the Communists levelled out the system of rich and poor, there was no one to help. It is written in old books–the Talmud, for example–that if the whole country does not help, then war and hunger will start. I believe that it was a miracle that the Maidan won in Ukraine, because for the first time in the country’s history, a huge number of people appeared who are ready to help others selflessly. And they were opposed by a group which never helped anyone. The ones who wanted to give were victorious over the ones who wanted to take. After the conflict in the East started, many Ukrainians began to make contributions to the army. But it should not be forgotten that giving to the army is not charity. Any person collects money to save his home. That is logical. To defend their country, people will contribute to their army. To help ATO soldiers is a sincere, normal process. But to help the wounded in hospital is charity. 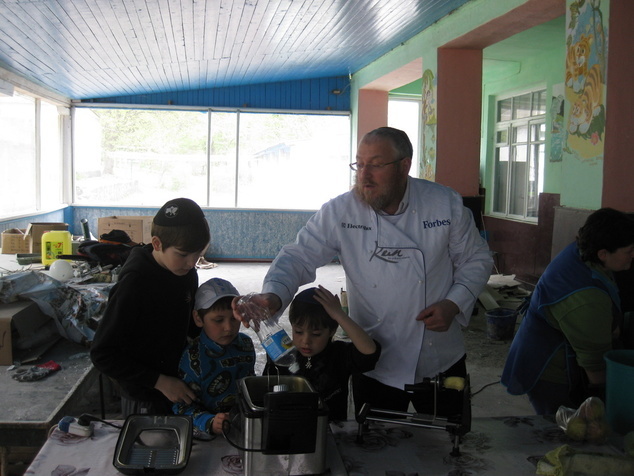 Uriel Stern and child refugees from Luhansk make potato chips in the boarding house for migrants for the town of Shpola. So far, charity in Ukraine has been spontaneous. Anyone from the tertiary sector of the economy will say that a spontaneous process cannot be subject to planning or control. Everything is done on feeling. This is still not a valid process; not everyone is aware that he absolutely has to give 25 kopecks from each pay packet. Why is it happening like this? Because no one here is lobbying for charity. There are a million refugees in the country. But where are they? What is happening to them? Where can we find out where they are? Who is looking after them? For 23 years, no one has implanted the idea in Ukrainians’ consciousness that it is necessary to help people. Yes, there were always people who contributed to religious organisations, schools, and hospitals. But overall society is only learning real charity. For example, every year there are conventions for all the charitable organisations in the world. In 2014, there was one such convention in Holland. It cost 3000 euro per person to participate in it. I found free tickets for people who wanted to go. But no one wanted to go from Ukraine. Russia was there. This just goes to show that the Ukrainian tradition of charity is only just starting. There is also the problem of distrust. Many people in Ukraine prefer not to notice the problems of neighbours and people far away, and feel that only cheats ask for charity. So no one has to give to charity. People here who have been given the mission of charity can go around on social media showing what a good time they are having on some tropical island–which hardly inspires trust in them. In USA, the biggest philanthropists live differently: Bill Gates drives an old car, Warren Buffet lives in an old house, Sergei Brin travels on the metro. They do not buy flashy cars. In our organisations throughout the world people can afford two things: expensive glasses, because you need to have good eyesight, and good shoes because you have to walk a lot and your feet have to keep up a furious pace. This entry was posted in English, Opinions, Voices of Ukraine and tagged #RussiaInvadedUkaine, #StopRussianAggression, #UkraineUnderAttack, #war in Ukraine, charity, VAAD. Bookmark the permalink. 1 Response to What Ukrainian volunteers and their patrons can learn from their Jewish counterparts. Muito bonito esse texto. Um exemplo para aqueles que não dá valor ao ser humano.